The success of your MQ initiative isn’t only determined by the published research. Your fortunes can shift dramatically in either direction, the moment a report gets published — so make sure you’re ready. Find out how to capitalize on a positive report and get full mileage with the media, channel and customers. Also, discover how to move swiftly to neutralize any negatives and avert disaster. Note: Although we refer to the Magic Quadrant (MQ), our advice is also relevant to signature assessment reports from other leading IT analyst firms. 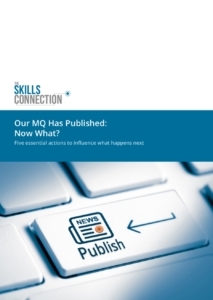 “Our MQ Has Published: Now What?” offers five essential actions to influence what happens next when an analyst report is published. Don’t leave it too late to get prepared. To receive your free copy of the white paper, please complete the form on the right hand side. Our experts will guide you through key events, audiences, activities and competitor threats that could shape the outcome of your MQ initiative. We delve into the detail of who needs to know what … and when. We know you’ll find it valuable when publishing day arrives.